Getting hold of this book was a little bit of a saga. I came across the first Claudine book in a secondhand bookshop and fell in love with both the charming story and the attractive old Penguin edition I had picked up. I resolved to collect the set of four in the same design and soon had three, but this one proved a bit of a challenge. Twice I ordered it from sellers on Abe Books only for the sale to fall through because they didn’t have it in stock after all. It was with some excitement I finally lined up my little collection. It’s a shame then that this instalment didn’t quite live up to the first two, though I hasten to add that it’s still a beautifully written and insightful book. But one of the things that I liked about the character of Claudine was her mixture of naughty wilfulness and youthful innocence. Now she is innocent no more. Or isn’t she? In this third book in the Claudine series she returns to Paris from a long, leisurely honeymoon with her husband Renaud. She is just 18 years old and her husband in his 40s, which gives us an early clue as to his sexual tastes. There is an uncomfortable section where the newlyweds visit Claudine’s old school and both flirt outrageously with the 15-year-old girls boarding there. Sexual attraction had been a major topic of the series previously but here that’s what it’s all about. Claudine had dabbled with both sexes before her marriage and the pattern continues. As well as loving her husband, she falls hopelessly in lust with a new acquaintance, Rezi, the buxom wife of a jealous invalid. Renaud immediately sees this and encourages Claudine in what she sees as him being an understanding husband, but I read as straightforward lechery. I won’t say which of us was right, but Claudine certainly has some lessons to learn. As always, Colette writes with great affection for the French countryside. This book is fairly sexually explicit but it’s not Henry Miller. The deed itself is usually skipped past. The narrative concentrates instead on Claudine’s reaction to events. It was with some relief I realised that her reluctance to give in to her desire for Rezi stems from wanting to be faithful to her husband, not the fact that Rezi is a woman. She has, after all, been there before. I can see why it took almost 60 years for an English translation to appear in print but I do wonder how shocking (or not) these novels were in France. First published as Claudine amoureuse 1902. Published as Claudine en ménage after the above edition had been destroyed. This translation published 1960 by Secker & Warburg. My edition published 1972 by Penguin Books. Source: I bought it secondhand via Abe Books. 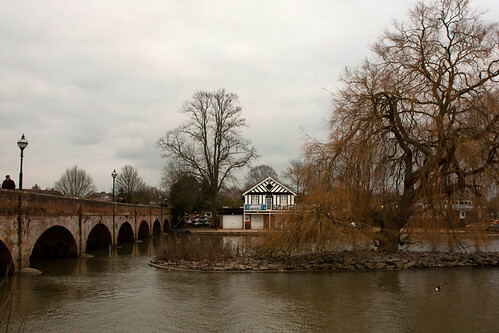 Tim and I have just (well, yesterday) come back from a few days’ holiday in Stratford-upon-Avon. We just wanted to go somewhere pretty to relax and have a break, but you’d have to try pretty hard to go to Bard Country and not do any Shakespeare tourism at all. We pretty much gave in and absorbed all of the culture, and despite the freezing cold had a lovely time. 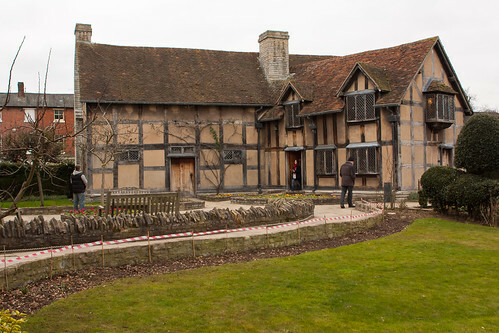 We saw not one but two RSC plays – The Winter’s Tale and The Orphan of Zhao, more of which later – and went to three of the properties run by the Shakespeare Birthplace Trust. And though I may have mocked the tourist-trap stylings of it all, there is something humbling about standing in the house where a great genius lived half his life. On a previous holiday we spent some time in Père Lachaise Cemetary in Paris and I paid my respects at the graves of Oscar Wilde and Colette, among others. 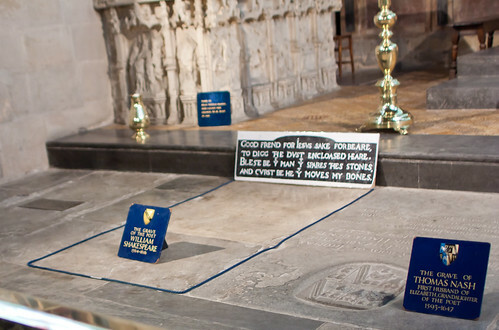 I have now added to this list of pilgrimages by visiting Shakespeare’s grave, in Holy Trinity Church. The town itself is pretty and though no doubt it’s prettier still in spring and summer, I was glad we had visited when we did after a taxi driver told us that the place was dead compared with how busy it gets from Easter onwards. It was far from empty. 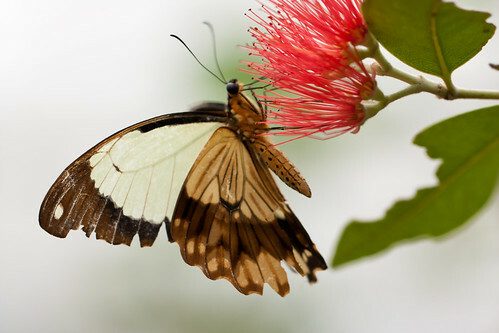 Having had our fill of plays and history lessons, on our last day we went to the butterfly farm. It was pleasingly warm and full of little flying creatures, though disappointingly lacking in educational information (Bristol Zoo does spoil us). I took a lot of photos there. As always, I’ll add more photos to Flickr (mostly of butterflies, no doubt) over the next few weeks. Feel free to have a gander. The Crime and Punishment read-a-long is hosted by Wallace over at Unputdownables. In week three we read from part 2, chapter 1 to the end of part 2 chapter 4. The official discussion post for this section will be posted over at Unputdownables but here are my thoughts. I have now read further than I managed on my previous attempt, which is an achievement. However, though the text is more readable in this translation, I find main character Raskolnikov just as frustrating. I’m going to plough straight into the plot so here be spoilers. I suppose I expected more of an insight into Raskolnikov’s mind than we have had so far. Maybe that’s to come. Or perhaps we’re supposed to infer his thoughts from his actions. But I am finding him inscrutable. Why why why does he turn down a good job offer, throw away money from his friend and try to reject money from his mother? Is he just ill, as his friends think? Is this a hypochondriac or even psychosomatic response to his fear of being caught? Or is it guilt/remorse? Certainly it seems to be all fear and no remorse. Also, Raskolnikov has friends! Who really seem to care about him. Is he/was he actually a nice guy? Or are Razumikhin and Zosimov just extraordinarily nice people? Can you see why I am yet to be convinced I will ever like this character? UPDATE: The official discussion post is now up. The Crime and Punishment read-a-long is hosted by Wallace over at Unputdownables. In week two we read from part 1, chapter 5 to the end of part 1. The official discussion post for this section is over here. My main problem with the first week was that I was reading a terrible translation. Monday lunchtime I headed to the library and compared three translations and all of them were better than the one I had bought myself years ago. So be warned: avoid the old Penguin Popular Classics edition with no translator acknowledgement. I am now reading the Oxford World’s Classics edition translated by Jessie Coulson in 1953 and updated by Coulson in 1981. Translation makes such a difference. I mean, I knew that in theory to be true, but I don’t think I have read a bad translation before. Even on just readability and interest, the first week I struggled to read 42 pages in a week. This week I started at the beginning again and easily read 83 pages in three days. I had to stop myself from reading ahead! Which I would still read as signs of depression, but it’s certainly less clear. They’re really very different readings. As for the content of this week’s reading, well here be spoilers. There’s an odd mixture of premeditation and chance here. Clearly, Raskolnikov has had this murder in mind for a month and even made preparations for it, but they’re not very well planned preparations. For instance, it really is chance that he is able to steal/borrow a hatchet when the one he had had his sights on is inaccessible on the day. And he takes no bag or other means of carrying away the old woman’s treasure, which is supposedly the whole point, if we are to believe his ramblings about this being his escape from poverty. As for his failing to lock the door behind him once he’s inside the old woman’s flat, is that poor planning, an understandable omission from a non-criminal or a lapse caused by his distracted, starved and half-crazed state of mind? If he’d only spent that money from his mother on food instead of unfortunate women would this crime have ever happened? Hmm. I am both excited to read on and a little nervous because it’s this next section that I gave up on last time I tried to read Crime and Punishment, back in December. Fingers crossed the different translation continues to work its magic. In honour of yesterday’s romanticalness (I’d have posted this yesterday but I was otherwise occupied) here is a chirpy happy love song from the 90s that makes me think of old friends more than love, but either way it makes me happy. The Wannadies – You & Me Song on MUZU.TV. I loved Levy’s novel Swimming Home, which was shortlisted for the Booker Prize last year and Levy was the National Book Awards Author of the Year 2012, so I was pretty excited when I found out this would be the first book in my subscription to And Other Stories. These are very modern short stories, zipping around different European locations and ethnicities, and incorporating modern technology reasonably well (which is something I basically never say, so kudos to Levy on that). But they’re not about story or location, they’re about emotions and characters and relationships. Most of the stories might be better described as sketches or scenes, which I think I’ve also said about Haruki Murakami’s short stories and I loved both, and I do see some similarities. Both are modern and city-centric, and sometimes the central character can be a little mysterious and cold. But more often, Levy’s characters are warm and racked with emotion. Both the characters and the events tend to be oblique, not straightforward. As with Swimming Home there are subtleties at work that mean a few different things could be happening. Sometimes details or even names of characters overlap between stories. I wanted to re-read some of them right away. My favourite is one of the shortest in the collection, “Placing a call”. It uses the second person and repetition and it’s immediately apparent that the narrator is unreliable. I also loved “Pillow talk”, which is at once a sweet love story and brutally honest. My only tiny gripe would be that none of these stories is new, they have all been previously published, which smacks a little of cashing in on last year’s award wins, but on the other hand it gives us Levy newcomers a chance to discover more of her great work, and it has definitely solidified my interest in her writing. Published February 2013 by And Other Stories. Source: I am a subscriber to And Other Stories. The Crime and Punishment read-a-long is hosted by Wallace over at Unputdownables. In week one we read from the beginning to part 1, chapter 5. The official discussion post for this section is over here. However, I thought I’d expand on my own thoughts so far. I’m finding it a slog. Already. I’m not sure if this is the grim subject matter (it’s super depressing) or the translation. I am reading a Penguin Popular Classics edition from 1997. The translator is not acknowledged at all, which is very poor. And a bit of searching on the Internet suggests it is not a respected edition. I may have to borrow a different translation from the library. But back to the book itself. In this short section we meet Rodion Raskolnikov, who was a law student until he dropped out due to money troubles. We find him in a depressed state, not at all in his right mind, barely getting anything to eat and seriously contemplating committing some terrible crime that he thinks will solve all his troubles. So far I am heavily reminded of Knut Hamsun’s Hunger, inasmuch as the setting is bleak and impoverished but the main character has clearly known a better life and perhaps that’s even why he isn’t dealing very well with poverty. He gives away money in random acts of kindness but then immediately regrets it. And of course the longer he goes without eating a proper meal, the crazier his state of mind becomes. But Hunger I found compelling and so far I am not compelled by this. I don’t find Raskolnikov sympathetic. Sure he’s upset by seeing women reduced to terrible circumstances by bad or useless men, but he doesn’t even say as much out loud, let alone do anything to help. He has resolved not to let his sister accept a marriage offer, on the grounds that not only is neither party in love, but they don’t even like each other and the suitor has a worrying idea that rescuing a woman from poverty will make her indebted to him for life. However, said husband would indeed be able to save Raskolnikov’s mother and sister from poverty, not to mention give Raskolnikov himself a good job. Either he hasn’t heard of the phrase “beggars can’t be choosers” or he hasn’t figured out that he’s a beggar. This is such a revered classic I am determined to keep going but I will have to see what the library has to offer in terms of different translations. It’s such a shame if that is my problem here.